This lovely six piece salon suite created in the manner of Louis XV features a sofa and four arm chairs (fauteuils) upholstered in an elegant Goblain inspired fabric. The coffee table topped with elegant polished creme' marble rounds out this incredible suite. 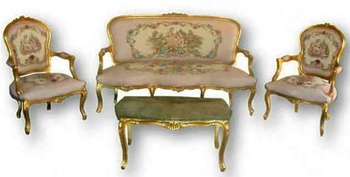 All pieces in this classical suite have been hand carved and expertly hand finished in rich gold leaf. The high quality Goblain style fabric used to upholster the sofa and chairs makes this glorious salon suite suitable for a palace. ADDITIONAL FAUTEUILS ARE AVAILABLE SEPARATELY SHOULD A LARGER SUITE BE REQUIRED.